Reprint Mel Bay Publications, Inc.
O'Neill's Music of Ireland is the definitive work of Irish traditional music. 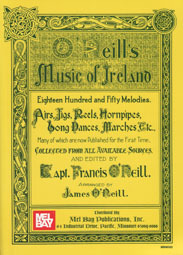 These 1850 melodies were written down by Captain Francis O'Neill and arranged by James O'Neill. Included are 625 Airs, 75 O'Carolan, 415 Double Jigs, 60 Slip Jigs. 380 Reels, 25 Hornpipes, 20 Long Dances, and 50 Marches and Other Miscellaneous Melodies. PUBLIC DOMAIN STATUS: This Mel Bay Publications edition appears to be an unabridged and unaltered replication of the work originally published by Lyon & Healy, Chicago, in 1903. All of these melodies were published in 1905 and are believed to be in the public domain in the United States. A photocopy of the Title Page and Copyright Page are included with each book to prove public domain status since Mel Bay did not include these two pages in this reprint edition. 66	Will They Ever Return? 120	Is Not This Pleasant? 145	Do You Remember That Night? 328	Do You Mistrust Me? 329	The Bay of Biscay O! 361	Will My Love Be True? 370	The Fair Hills of Eire O! 413	Leather Away With the Wattle, O! 462	My Bold Trainer O! 503	Once More I Hail Thee! 522	Where's the Slave So Lowly? 543	Devil Take the Wars! 601	O! Nancy Don't You Remember? 614	Doth Not a Meeting Like This? 620	Oh! Dear What Can the Matter Be? 621	Mary, do You Fancy Me? 714	When Sick, Is It Tea You Want? 741	Do You Want Any More? 865	Wasn't She Fond of Me? 873	Is it the Priest You Want? 890	How Are You Kitty? 1102	How Much Has She Got? 1109	Be Easy, You Rogue! 1132	"My Mind Will Never Be ""Aisy"""
1133	Will You Come In? 1150	Here's Good Health to the Piper! 1163	Another Jig Will Do! 1413	Molly, What Ails You? 1464	Girls, Will You Take Him? 1758	Where Did You Find Her? 1829	How is Your Mother?